According to a report by research and information company Ken Research, the car rental market in India will exceed Rs 800 billion by 2019. 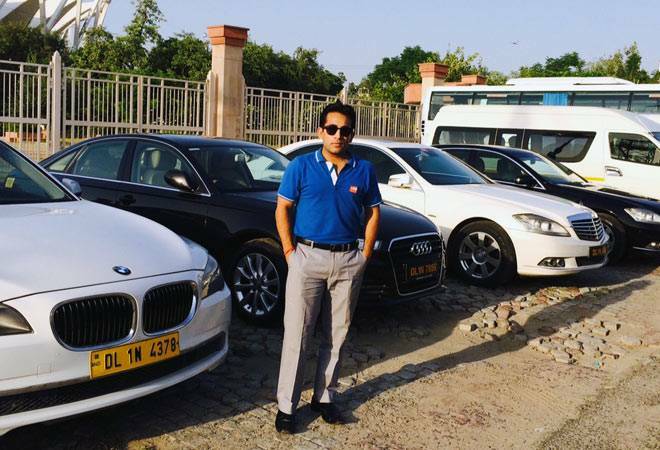 Joint Managing Director of Eco rent a car Aditya Loomba with the company's fleet of luxury cars. In recent years, transport services segment has emerged as a booming market in India and huge investments have been poured into the segment. Besides the hugely popular names like Ola, Uber, Meru etc, the segment has several small players and a large section of it is unorganised. But another sub-segment in this industry, which has been garnering a lot of attention is self-drive car rental market. According to a report by research and information company Ken Research, the car rental market in India will grow at a considerable CAGR rate and exceed Rs 800 billion by 2019, due to the increase in number of bookings done online and through apps. The car rental sector in India is dominated by large companies such as Carzonrent, Ola cabs and Meru cabs and they possess the maximum market share in the organized sector, the report says. However, the segment has several other players like Zoomcar, Avis India, Revv, Just ride, MiCar, Eco rent a car etc. An interesting offering by these companies is renting out of luxury cars like Audi, BMW, Mercedes etc. According to Aditya Loomba, Joint Managing Director of Eco rent a car, though the market for luxury cars sees most demand from international clients, its demand is growing among Indians too because of increase spending power. "We are getting a very good response on self-drive service and a lot of people travelling on weekends like to avail this service. While there are others, who are fond of driving German cars but they can't afford to buy so they rent one. "Our self-drive segment is growing at about 80 per cent year-on-year," Lumba said. Eco rent a car, established in 1996, claims to be the oldest entrant in this segment and allows to rent luxury cars like BMW 7 series, Audi Q7, Mercedes S-class etc. for a sum of Rs. 22,000 and security deposit of Rs 3 lakh. The company, which also offers employee and corporate transportation services, has a fleet of around 2500 cars; about 600 of which are used for car rental vertical. Eco is also preparing to launch a mobile-app soon and this would bring it in same league as biggies like Zoomcar and Carzonrent, which rent out luxury cars online and via apps. Carzonrent India introduced its self-drive service Myles in 2013 and claims to have over 1200 cars within this segment across 21 cities in India. "The self drive service has seen growth in India now because of the general rise in awareness on the actual cost of owning a car. Apart from the EMI that we pay to own a car, there are a number of other cost such as maintenance, insurance, parking, fuel etc. All these costs pile up even though a personal car stays idle for most of the time. Self-drive eliminates or reduces most of these costs by a convenient method of driving a car of your choice based on the occasion you need the car for," said Sakshi Vij, founder and CEO of Myles. "We see tremendous potential of growth in this segment within the self-drive space. Over the next 3-4 years, we expect the Self-drive universe in India to have around 2 Lakh vehicles. At least 20 per cent of this growth with be contributed by the luxury segment," he added.